I took this picture in 2004. It was part of our trip for my D.Min. graduation from Gordon-Conwell Theological Seminary. We went as a family. And on Saturday afternoon we drove up the coast to Maine. We walked on the beach and I caught this image, while walking behind my 4 boys. It is a great family memory. But this picture has come to mean so much more. It reminds me of my mission! 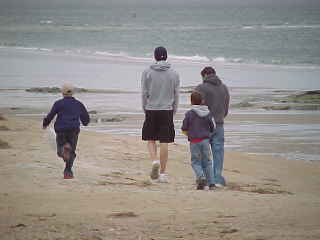 This picture is of my 4 boys walking away, into the unknown world before them. That is my job as a Dad! I have to equip them to walk forward – away from me and into the future God has for them. Their faces are turned toward the future. They walk near each other – in connection with each other – but each walking on their own – in their own way. 1) Show them how to love Jesus and remind them why we do! Conversations, practical actions, involvement in church and ministry… all let them know that this isn’t lip-service, but love for a Savior who loved us. 2) Know the Proverbs and teach them. There is no more practical part of Scripture – especially for boys who will be men. This should be part of how I live my life and I need to explain the truth of these life principles. 3) Pray for them and love them. Help them stand, but remind them that none of us stands alone. 4) Instill care for each other. Talk to your brothers, spend time with your brothers, play with your brothers (whether you like it or not). How have we done this? The whole family goes to each others events to show support. For many years, Sunday afternoons were family play times. If you wanted to do something, you did it with your brother. No friends – – just focused time with each other. After years and years, it’s so good to see them laugh and play together! 5) Help them hear God’s call. Remind them constantly that God gave you gifts and abilities so you can do what He wants you to do! And when you find that, you will find great joy! Don’t give up until you do find it. And then use it to share the love of Jesus with others. There are so many parts to raising men. But these few priorities have helped us stay the course. Two of my men have left the nest and I’m proud. Two are on their way… with great hearts and a great big love for Jesus. If you think of my men, would you pray for them? With God, their future is bright.